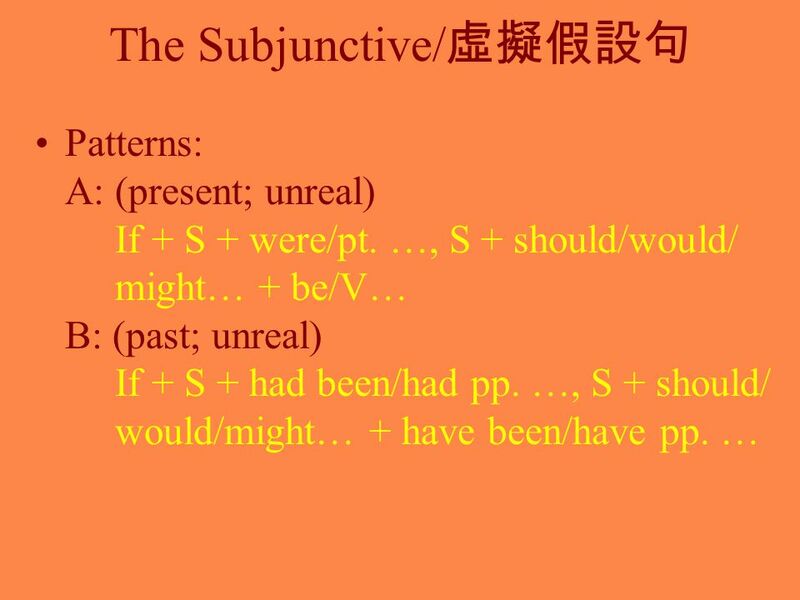 The Subjunctive/ 虛擬假設句 Patterns: A: (present; unreal) If + S + were/pt. …, S + should/would/ might… + be/V… B: (past; unreal) If + S + had been/had pp. 3 A: The truth is that I am busy now and I can’t talk to you. But, I do like to talk you. What can I say? 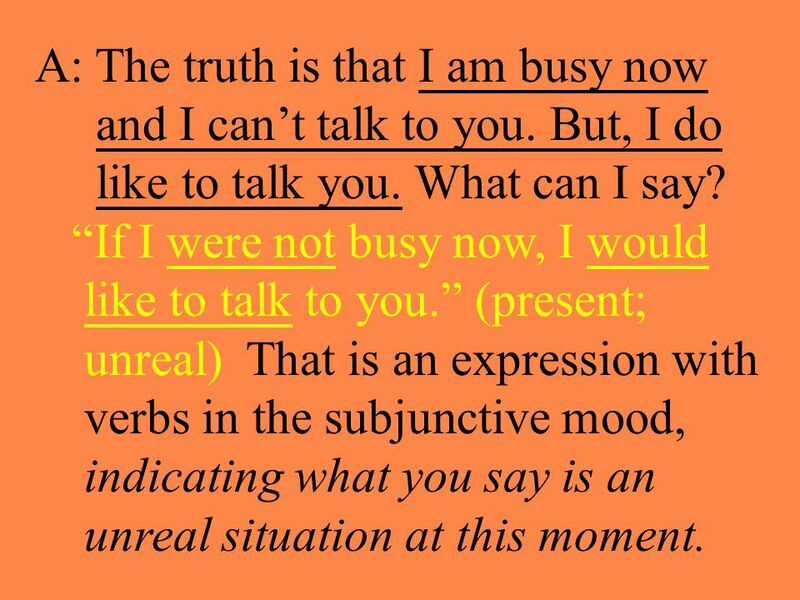 “If I were not busy now, I would like to talk to you.” (present; unreal) That is an expression with verbs in the subjunctive mood, indicating what you say is an unreal situation at this moment. 4 Look at another example. Mary is the only child in her family and she often gets very lonely. 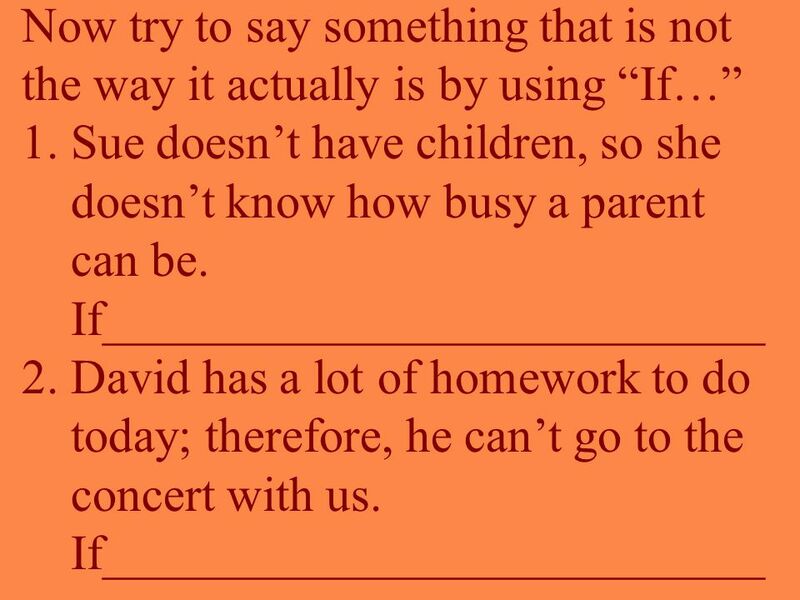 It’s very likely that Mary will express how much she wants a brother or sister to play with. 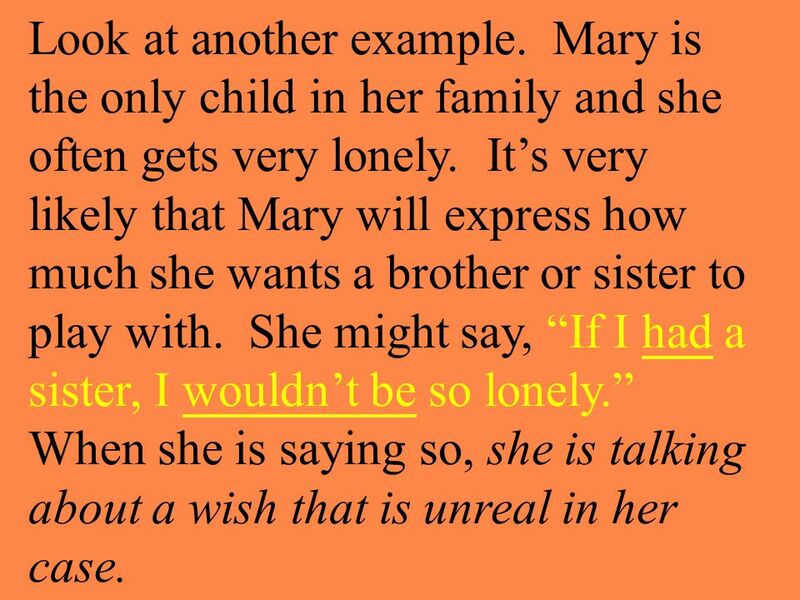 She might say, “If I had a sister, I wouldn’t be so lonely.” When she is saying so, she is talking about a wish that is unreal in her case. 6 I’m glad I’m not the chicken in the oven. 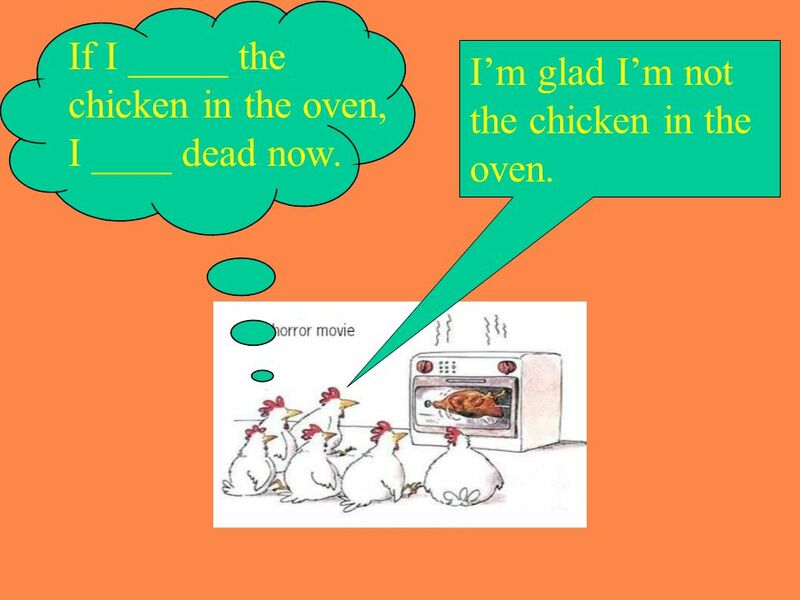 If I _____ the chicken in the oven, I ____ dead now. 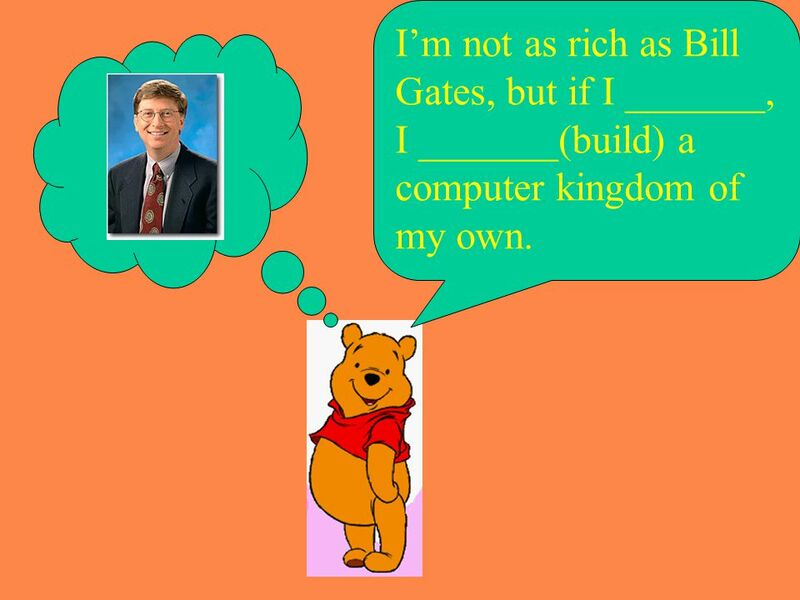 7 I’m not as rich as Bill Gates, but if I _______, I _______(build) a computer kingdom of my own. 8 Now it’s time that I introduced to you something more difficult about the subjunctive. 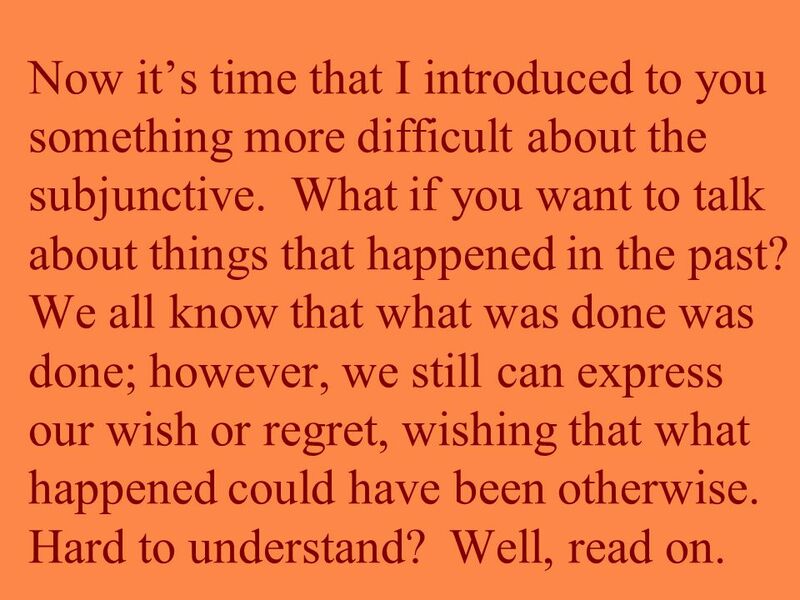 What if you want to talk about things that happened in the past? We all know that what was done was done; however, we still can express our wish or regret, wishing that what happened could have been otherwise. Hard to understand? Well, read on. 10 Did you watch TV last night? My favorite baseball team was defeated by yours. Really? I didn’t watch TV last night. But if I _____, I ____ (happy) to see the result then. 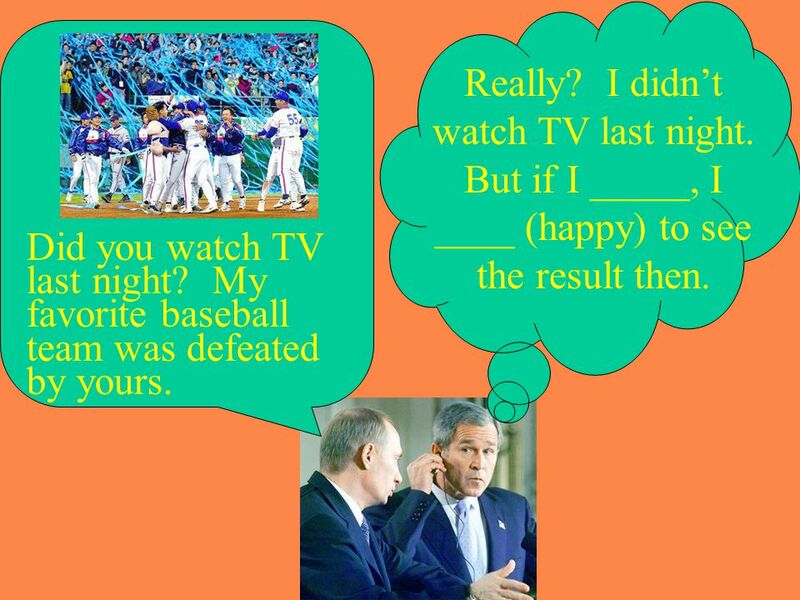 Download ppt "The Subjunctive/ 虛擬假設句 Patterns: A: (present; unreal) If + S + were/pt. …, S + should/would/ might… + be/V… B: (past; unreal) If + S + had been/had pp." Daily expressions Talking about things happened in the past. You are always happy as a child. *Affirmative Agreement When indicating that one person pr thing does something and then adding that another does the same. Use the word so or too. To avoid. Reported Speech Dragana Filipović. Direct Speech Quoting someone’s actual words: “I knew the answer,” he said. “Do you take sugar?” she asked. “Let’s. Explain Cause & Effect Relationships For Actions. Using School Activities. 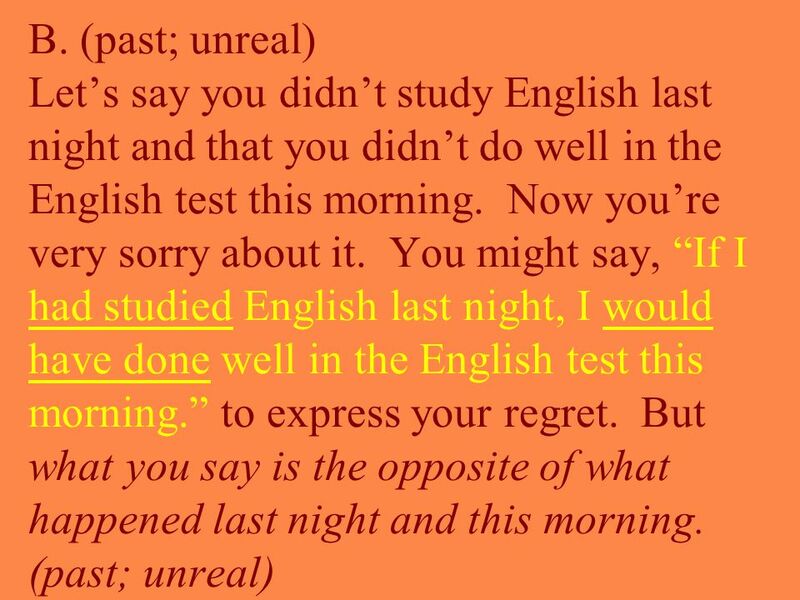 Modal verbs (1). Present and future ability *can /can’t *be (un)able to E.g. Peter can ride a bike. I can’t speak Japanese. I can come out with you tomorrow. OBLIGATION: MUST HAVE TO SHOULD. PRESENT/ FUTUREPASTEXAMPLES MUST: Subject+ must + verb _______ (past obligation is expressed with had to) You must go.